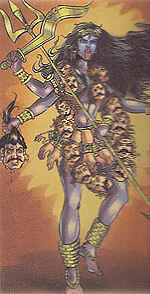 Kali is the fierce from Durga or Parvati . While fighting the demons, Durga realised that she would have to change herself into a violent and destructive force in order to kill the demons Chandra and Mundra. In a fit of rage, Durga poured out lightening from her third eye. From this stark light a dark female figure was formed, with blazing eyes and disheveled hair, her red tongue shining bright. She did not wear diamonds or gold, rather a garland of human skulls, and cobras as bracelets. Armed with a trident, a sword, and a human skull in three hands respectively, she gave her blessings with her fourth hand. Once created, the blood thirsty goddess went on killing the demons. She killed Chandra and Mundra and earned the name of 'Chamundra'. Then Shiva appeared and threw himself at her feet to stop the rampage. Seeing Shiva at her feet, she realised her mistake and stopped the slaughter.